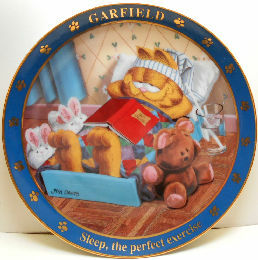 Garfield says: "Sleep, the perfect exercise" on this decorative collectible plate. It is part of the collection A Day With Garfield. The plate was produced by The Danbury Mint, copyright 1978. The plate is 8" in diameter, with a gold rim. Previously owned but in good condition.